In the intensive sunlight from the blinding midsummer sky, the graceful flowers of sacred lotus are coming into bloom magnificently above the pond surface covered with deep-green lotus leaves. An unstained white flower of sacred lotus appears in a dignified manner from the depth of dirty mud water and, therefore, is referred to as the divine flower symbolizing the great wisdom and mercy of Buddha. 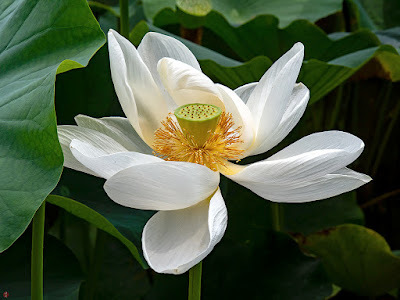 In Buddhist culture, there is a tradition that such a pure-white lotus flower blooms in Nirvana (Pure Land) and Amithaba (Amida Nyorai) is seated on it. 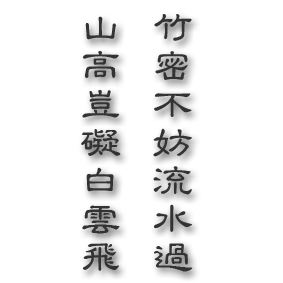 The blooming period of a lotus flower is about four days and its silky petals silently fall apart in the calm hot wind at last.